Balancing Jane: Atheists, Privilege, and Visibility: Who's Passing in America? Atheists, Privilege, and Visibility: Who's Passing in America? I have a couple of friends (who I hope will weigh in with some thoughts on this post) that are dealing with the public backlash against atheists (or even just against anyone who dares to say that they're not Christians). This Examiner article from 2012 explains that while nearly 20% of Americans are non-believers, only 2% identify themselves as "atheist." A majority of Americans polled in 2007 (53%) said that they would not vote for an atheist. I've personally heard several people say that they "don't trust" atheists because they don't have a moral compass. It's no wonder that so few people would want to voluntarily take on a label that's going to immediately demonize them in the eyes of so many of their peers. Ending oppression, though, often requires people to personally connect with someone from the oppressed group, and as long as people can imagine that they don't know any atheists, it's much easier to keep envisioning them as a set of stereotypes rather than actual people. That's why there are now campaigns within the atheist community encouraging its members to "come out." That rhetoric is of course borrowed from the gay community. Reading these atheists campaigns reminded me of the scene from Milk where Harvey Milk encourages his friends to call their families and come out as gay. "They vote for us two to one," he explains, "if they know they know one of us." I am not gay, and I am a theist, so these two particular systems of oppression do not have a direct impact on my personal life. However, I believe that all systems of oppression are intertwined, and I do care about them on a personal level. Thinking about how important it is to be able to be honest and public with your identity left me sorting through some different systems of oppression. 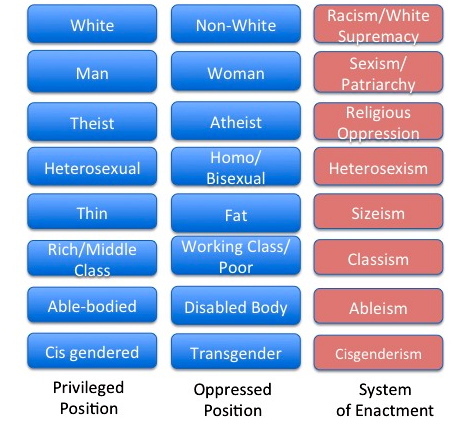 Here's a quick chart (based off of one I saw from a diversity class and by no means meant to be all-inclusive) of binary oppressions in American culture. I am not playing Oppression Olympics, and I am making absolutely no comments on which system of oppression is "worse" than any other. I truly believe that all of these systems of oppression are all part of the same over-arching system, and I see an improvement in the balance of one as an improvement for the greater good of all, whether that one personally impacts me or not. That said, there are clearly some systems of oppression that are more visible than others, both categorically and individually. Race, for instance, is often very visible as a category, but it can be less visible for certain individuals. This is especially true for people whose racial identity is "mixed" by our racial standards (though all race is a social construct) and who shift their racial identity within several different categories. It is also evident in the history of racial passing. "Passing" is often seen as a deceitful or even cowardly thing to do, and there is a lot of tension within groups over the issue of passing. This is most true of oppressed groups where membership in the group is particularly visible. If you are non-white, that is usually evident to an outside observer. If you are a woman, that is usually evident as well, and the general public seems to get uncomfortable and cruel when it isn't. In fat activism, there are often battles over who gets to be considered as a member of the group, often turning into a discussion about "in-betweenies" and whether they qualify. When a group's identifying label is usually placed upon them by the public, the issue of passing becomes a touchy one indeed. But what about those other groups? Is it okay to "pass" as Christian? In our culture (at least in my experience), most people will assume you are a Christian if you don't say anything about religion. Of course, there are exceptions to this when it intersects with other systems of oppression. If you look like someone of Middle Eastern descent, for instance, the public may make assumptions about both your race and your religion, putting you on the oppressed side of two systems without even talking to you. 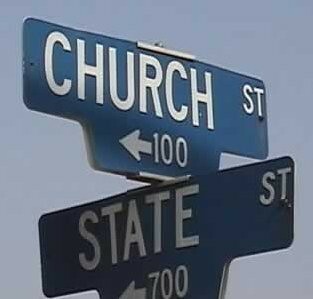 For many people, though, simply staying quiet about religion is enough to grant you access to the privileged majority. This has also been true of homosexuality. It's where misguided policies like Don't Ask Don't Tell came from. While some people may make assumptions about you because of your mannerisms or style of dress, there is an accepted standard of heterosexuality that many people can gain access to whether they identify as members or not. This is also true for many types of disabilities. While some disabilities are readily visible, many are not. People will make assumptions that a person is able-bodied and the person is granted access to that group until they self-disclose their status or are put into a position where they are not physically able to perform a task, thus "outing" themselves. The reason that the larger movements around these systems of oppression are putting so much emphasis on "coming out" is because invisible passing strengthens the systems as a whole. If people can simply assume that everyone they meet is in the privileged majority, then they do not have to--as Harvey Milk put it--know anyone in the oppressed group. Not knowing is, of course, one of the privileges. Being able to not have to think about your identity in terms of where you fit or how that identity works for or against you is one of the hallmarks of privilege. Assuming that everyone else around you has the same privilege is privilege incarnate. And we work really, really hard as a culture to make passing easy in a lot of circumstances. Religion, I think, is the most obvious one. For most people, simply saying "I'm a Christian" is enough to appease the membership requirement. You don't need to go to church (only 31% of Americans attend regularly, and only 25% of Catholics go to weekly Mass). You don't need to read the Bible. You don't need to do anything to prove that you're a Christian (unless, again, we're butting up against other systems of oppression, as is the case with those Obama is a Muslim claims). Nearly 80% of Americans declare themselves Christians, and it is to the benefit of maintaining their privilege to not question that number too hard. The more "Christians" there are--even if just in name--the easier it is to maintain the position of power. I said earlier that I am a theist, and that's true, but I have often wondered if I am passing as a Christian, and it sometimes makes me feel guilty. I've written before about my journey in faith and how it's recently led me to a Unitarian Universalist church. If you ask me to identify my religion, I will tell you "Christian." I love the story of Jesus and believe in the principles of the faith I've found through him. I do not believe in the Bible literally, but I believe that it holds many truths about the world and our place in it. I believe that other faiths and belief systems (yes, even atheist ones) are also able to access many truths about our world and our place in it. I believe that there is a Creator, and I believe that the mysteries of the universe are much too large and people are much too flawed for any one human-made belief system to encompass them all. Why do I take on that label? I want to believe that it is because Christianity is the best religion to encompass my beliefs and that it gives me a place to find community and guidance. Could it be, though, that I just want the privilege of belonging? Could it be that having no clean label for what I believe is too scary and putting on that label is just too easy? I'm most interested in what invisible passing means for our systems of oppression as a whole. If all of these systems are intertwined (and I believe they are), then allowing one to be held up without question works to ultimately strengthen them all. Calling upon people to identify themselves fully and loudly is one way to combat the pressure to invisibly pass, but it places us squarely in a dilemma of individualism vs. collectivism. It is for the greater good of the collective that people own up to who they are and identify fully with every group to which they belong, especially if that group is one of the oppressed ones. There is strength in numbers and even just naming an identity for what is can be empowering (see, for example, the fat activist community's emphasis on "fat" not being a pejorative term and the Black is Beautiful movement of the 1960's). At the same time, though, individuals are more complicated. For one thing, we are never just any one identity. We operate under an intersecting set of identities that shift throughout our lifetimes. If today I declare myself a "non-Christian theist" and two months from now declare myself a "Buddhist" and then five years from now determine that I am a "Baptist," I could be 100% sincere and honest. That could be an accurate portrayal of my journey in faith through time. Likewise, I could today be an "able-bodied" person with full access to those privileges, spend some time using a wheelchair* after an accident, and then recover to regain my privilege and able-bodied status. I have already in my lifetime gone from being "poor" to "middle class" through luck, education, and work, but that is an unstable label that is one personal tragedy away from removal. I say all of that to point out that our identities are never as simple embodied in ourselves as they are when embodied in the group. The group can focus on a single facet of identity. It can focus on one system of oppression (though it should never do so to the detriment of others if it hopes to be effective) and it can focus on how people identify in the moment. As individuals, we carry with us our other labels and our histories. We have more at stake than a possibly temporary sense of belonging, and we have to make those choices within that more complicated framework. Finally, there is a difference between casually identifying with a particular group and doing activist work within in, but the line between the two can be hard to walk. When I was talking to one of my non-Christian friends about the oppression of atheists, he expressed that he didn't feel he could just be an atheist and be left alone. He felt pressure to either keep quiet about his identity or to be nearly militant in the declaration of it. For him, there was no middle ground. If he was going to identify as the oppressed, then he had to fight that oppression. What do you think? Are there any systems in which you are passing? When do you decide that a public declaration of identity is important? I pass for straight. Husband, kids, suburban house, hybrid car. Bisexuality is not stamped on my face or mode of dress. Seeing me in public, no one knows I kiss girls. And unless my jewelry is outside my shirt, I pass for Christian (default setting in my area), although I am not. I don't wear the item to make a statement, I wear it because it is important to me. To the casual observer, I pass. To people who know me, not so much. "To the casual observer, I pass. To the people who know me, not so much." I think you're making an excellent distinction in what it means to know someone. I bet that some of those people who don't know you think they do. I understand the need and power in coming out as x, y, z et cetera, but so often the rhetoric about this all just makes me feel like if you...chose your battles? I guess, then you're morally failing or something. As you say, people's lives are complicated and it's not possible to make yourself visible at every moment. If every moment of every day everyone I saw knew I was a lesbian atheist with a panic disorder, I think I'd be driven up a wall and that's not my fault. The point is just that coming out should be a tool not an albatross; each individual uses it as needed and sometimes might have to step out of their comfort zone, but, most of the time, people should not be made to feel guilty for "passing" whether by accident or purposefully. Excellent points. I especially agree that it's too much to ask of a person to have them "fight against all of society with each second of [their] existence." Sometimes getting involved in some kind of activist work within one of the communities you belong to can make it feel like that's your job, but it's completely unsustainable. I identify with your religious beliefs SO much. Agh, why didn't we talk more? !